From rabbit to duck, in the blink of an eye! Routine 1: Show a silk where a rabbit is drawn. Fold it, say a magic word and, just an instant later, spectators will see a funny duck instead of the rabbit. Routine 2: The magician shows a yellow silk with the drawing of a rabbit. He folds it and has a child to hold it. Now he shows a red silk with the drawing of a duck, he folds it and has another child to hold it. 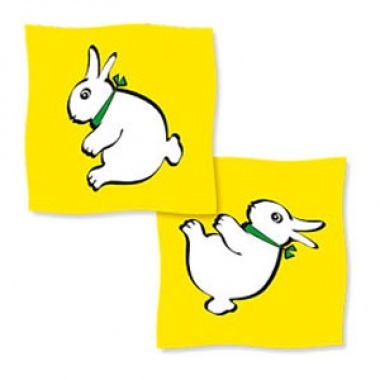 But, with a magic gesture the two animals will exchange their position: everybody will now see the duck on the yellow silk while the rabbit is on the red one. - 100% pure silk, 18". - Needs no practice, ideal for kids shows. - Available in red and yellow colors. - The set is composed of a yellow and a red silk.